The 2nd Viscount Rothermere (d.1978), Daylesford House, Gloucestershire. These Grecian-scrolled and painted chairs relate to 'Drawing Room' chair patterns in Thomas Sheraton's Cabinet Dictionary, 1803 (pl. 1). They bear the brand of the Exeter craftsman William Thoms, whose 1821 advertisement recording 'Furniture for sale and for inspection' bore the address 10 High Street, Exeter, Devon. 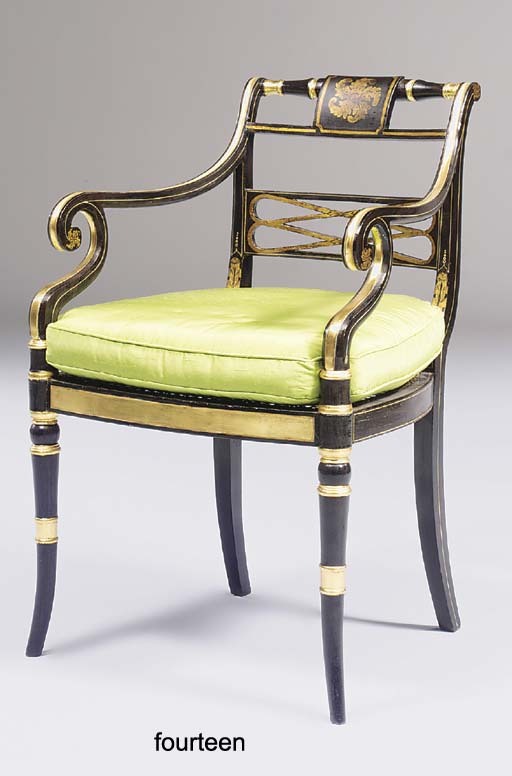 Four Regency side chairs with the same sphere-capped and reeded columnar legs and bearing the Thoms brand, were sold from the collecton of the late Mary, Viscountess Rothermere, Christie's New York, 16 April 1994, lot 126. This lot has been withdrawn from the sale.